South Africa, 5 rand, 2008. Nelson Mandela's 90th birthday. "SARB" - South African Reserve Bank. Canada, $2, 2012. Laser-engraved maple leaves. I don't have pictures handy, but 500 yen coins since 2000 have micro-engraving ("NIPPON") hidden in design elements as a security feature. I believe this is one of a very few instances of this being used to deter counterfeits. Obv. : ONE POUND · ONE POUND (12 times as incuse micro legend near edge) / 2016 · ELIZABETH II · D· G· REG · F · D (“2017 Elizabeth the Second by the Grace of God Queen Defender of the Faith“)/ J.C / £ 1 (hologram-like image below the bust) , her head (fifth portrait) facing right, wearing the George IV State Diadem, engraver´s initials below truncation of head. 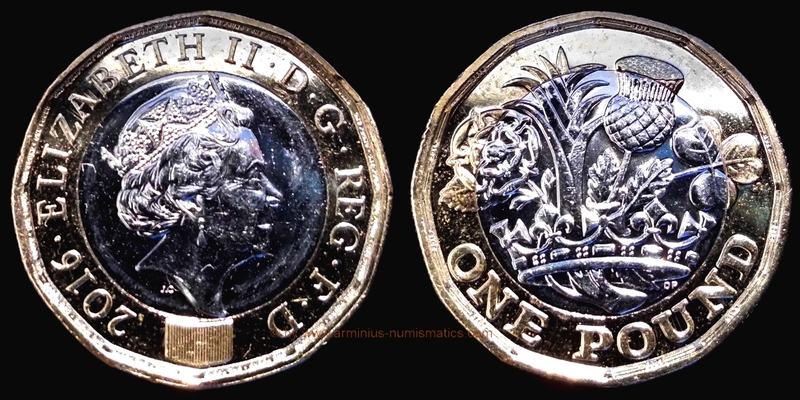 The 'latent image' on the obverse is like a hologram that changes from a ‘£’ symbol to the number '1' when the coin is viewed from different angles ( ‘£’ symbol if the illumination is from left, 1 if from right. Rev. : — 2016 — (12 times as incuse micro legend near edge) / DP / ONE POUND , design showing the English rose, the Welsh leek, the Scottish thistle and the Northern Irish shamrock emerging from one stem within a royal coronet, engraver´s initials r. below coronet, value on brass ring below. Edge: Segmented reeding (6 milled segments on alternate edges). 2016 500.000.000 500 million circulation issues dated 2016 but not released until 2017. 2016 10,000 in BU sets with 'Cross-crosslet' mint mark, also issued in Silver Proof, Silver Piedfort Proof and Gold Proof. Launched for circulation by the Royal Mint on March 28th, 2017 as "The world's most secure coin". Did you mean this coin? I could not find any micro-lettering. There is holographic thing in zeroes on reverse.